Preparation is the secret to unlocking success in the field, and the Winchester 40gr .22 long rifle hollow point was engineered to do just that. 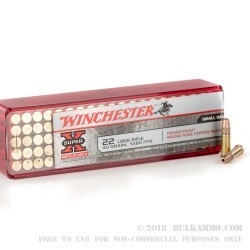 At a price point that anyone can afford, and a level of performance that all will envy, the Winchester 40gr .22 long rifle hollow point is the ideal ammunition for those looking to spend more time improving their skills without having to spend a fortune. 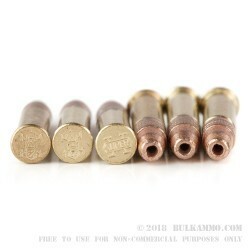 The 40gr hollow point rounds are ideal for target shooting at the range or on the farm. At an average muzzle velocity of 1,255 feet per second, Winchester 40gr .22 long rilfe hollow point rounds can accurately engage targets out to 100 yards and beyond. Ideal for handguns and revolvers such as the Ruger Bearcat and Sig Sauer Mosquito, competitive target shooters can now practice and build solid fundamentals across and myriad of platforms more affordable than ever before. The Winchester 40gr .22 long rifle hollow point is an incredible value for target shooters looking to improve their skill set, while remaining affordable enough for even the most high volume of shooters today.